I relocated to Tampa from a city where we don't have many trendy restaurants. 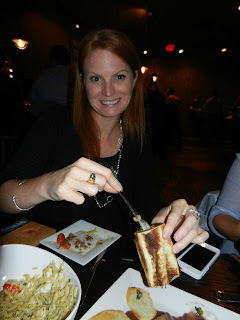 While living in Daytona, one of my favorite places to enjoy dinner and drinks with my girlfriends was a wine and cheese shop which served small plates. When I heard about Cru Cellars in South Tampa, I knew instantly that I would fall in love. Cru Cellars was voted Tampa's "Best Wine Bar,"which is obvious upon walking in. They have a great wine list. Cru has more than 25 wines by-the-glass, an amazing wine garden and seven different wine flights on their menu. Honey, I'm home. Tuesday nights are no cork nights, the only requirement is to purchase something off their dinner menu. Cru also offers a weekend brunch on both Saturday and Sunday. Speaking of food, let's talk the dinner menu. Cru's kitchen is open Tuesday-Saturday 4:30 - 10pm. They offer a new fall menu which is perfect for sharing and pairing with wines. I could not find a single thing that I would not happily eat. The one dish I loved the most was the Spice rubbed Lamb Chops. I am starting to enjoy lamb more and more these days. This dish had a chimichurri sauce, fresh mint and parsley, served with a parsnip and yukon gold potato purée. Another dish that blew my socks off was the Roasted Mushroom Orzo topped with Roasted Grape Tomatoes and Parmesan Cheese. This was an amazing dish. It had a perfect creamy texture with great seasoning. I loved it and could have licked the bowl clean. The Fig Jam, Prosciutto, Bleu Cheese and Arugula flat bread is a new favorite. Perfect amount of sweet and savory between the sweetness of the fig jam along with the salty prosciutto, spicy arugula and creamy bleu cheese. For dessert, we were really naughty and got the Glazed Donut Tres Leches Bread Pudding. Yes, you read that right. I cannot explain this dish in words. I don't even like donuts and I could eat this all night long! During dinner, we tried out three wine flights: Don't you love their flight set up? Stemless glasses, a chalkboard indicating which wines were what. Genius. Cru has a new wine garden which reminded me of being on a rooftop bar instead of MacDill Ave. It's an amazing space. Cru also has a retail space offering retail with high end wines down to the $13 table where you can find great priced wines which wont hurt your wallet.